University of Aberdeen’s painting is inscribed with ‘L. C. D. 1890’: the signature initially appeared to be that of Lowes Cato Dickinson (1819–1908). Was it copy of another painting at the Government Art Collection, or General the Right Honourable Robert Cornellis (1810–1890)? Andrew Greg commented that there seemed no reason to doubt the authenticity of Aberdeen's version. The Government Art Collection's online catalogue says their version is inscribed 'REPLICA / A / 18LD89', suggesting that there is an earlier prime version. Barbara Bryant summarised the findings: the prime version of this portrait was painted in 1888. From this version a print was published in 1890. The Government Art Collection's version, with initials and date 1889, is a full-size copy (formerly in the Governor's collection in Gibraltar). The Aberdeen portrait is a half-size copy, dated 1890, from the Yule collection. It came from Murchison of Tarradale Memorial Trust, initiated by Amy Yule. Her father, Henry Yule, the noted geographer and scholar, knew the sitter, so it seems reasonable that he would have wanted a copy of his friend's portrait. The artist of this work is now known to be Dickinson (1819–1908). The sitter’s full name (General the Right Honourable Robert Cornellis, 1810–1890, Baron the Lord Napier of Magdala, GCB, GCSI, Governor of Gibraltar, 1876–1883) was added to the painting record. 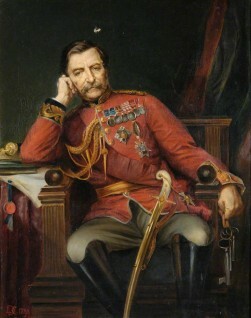 Could this portrait be by Lowes Cato Dickinson (1819–1908), or just a copy after?